If you have brown eyes, then you will be luckier in the poker games because both of the lens we have for you, will not change the original color of your eyes. ① The normal invisible ink contact lenses with big dyed circle are popular with the brown-eyed players. 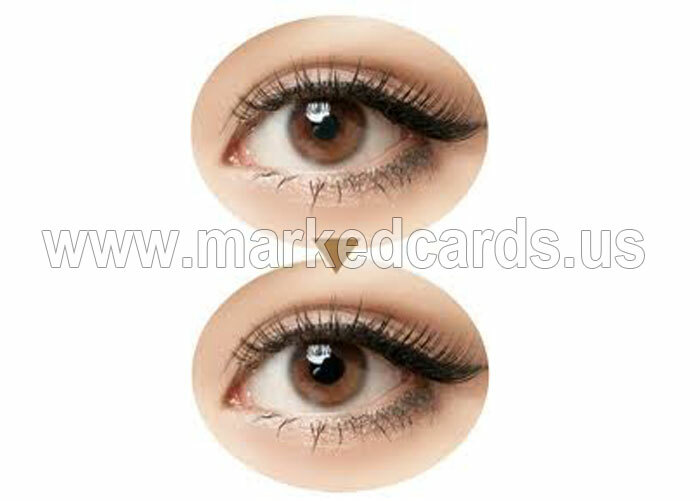 This kind of lens is favored in quality with which you can detect the invisible marks clearly and easily. However, we are honest to tell the users that these lenses are going to darken your eyes a little bit. What is fortune is that the change of the color is so trivial that it is almost impossible to notice. This kind of lens is reasonable in price and helpful in games. ② The other type of the invisible ink contact lenses with smaller dyed circle for brown eyes is more advanced in technology. It adopted the sophisticated sandwich technology and the technology of laser dyeing, which causes no side effect on your eyes. These lenses enable you to keep the original brown color of your eyes, without slight change. Moreover, the effect of he lenses is so awesome that you can spot the invisible marks as you wish. However, the price is higher but still acceptable for most users.